Recently I had visited Mr. Alagarsamy’s Drumstick farm, he found a new variety which has a high yield. The farm is near Dindigul. I had visited his farm, just before returning to Singapore. Here is the article about him in hindu. Regarding the drumstick - I am looking for this plant - two or three maximum - any idea where I can get it - maybe directly from mr. alagarswamy - I am specific about the variety - will it do good in HYD climate. Also if you can post few tips on growing drumstick as per Alagarswamy - that would be great. I am leaving singapore to india saturday. I will meet him and check with him. I hope it should be ok. because farmers are buying from him all over india.His variety is his invention of 10 years research. It has a life span of 25 years. it is a high yield capacity. Under natural farming you can increase the yield. send me your contact number, as soon as i reach there, you can talk to him directly. I was working in hyderabad with a french architect long time back. But now hyderabad must in a different style. Drumstick is such a crop which requires less care to give maximum benefits to human by giving drumsticks and leafs to boost calcium, fodder for animals, cool greenness in environment and rich nutrients to earth. 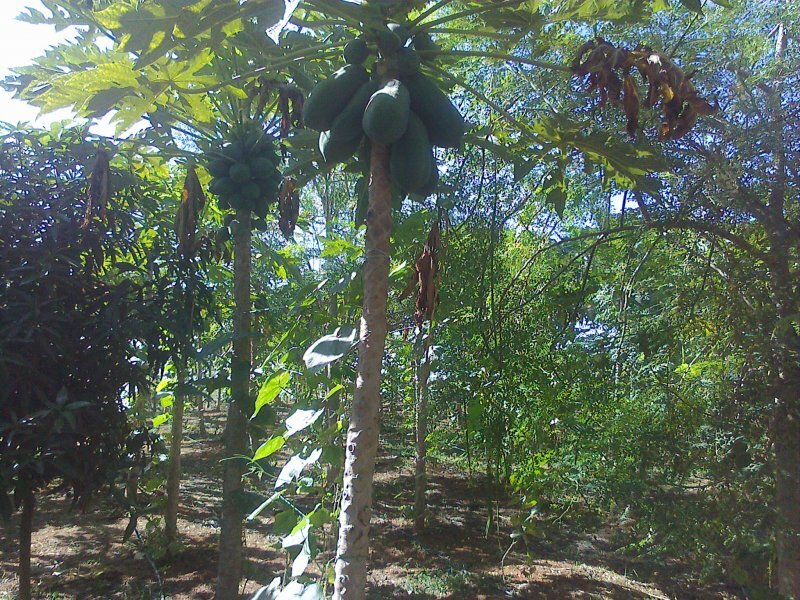 See the photo attached, the plant is standing along with Mango, Papaya and giving year around fruits without stopping its yield. released by our Horticulture University at Bhagalkote. 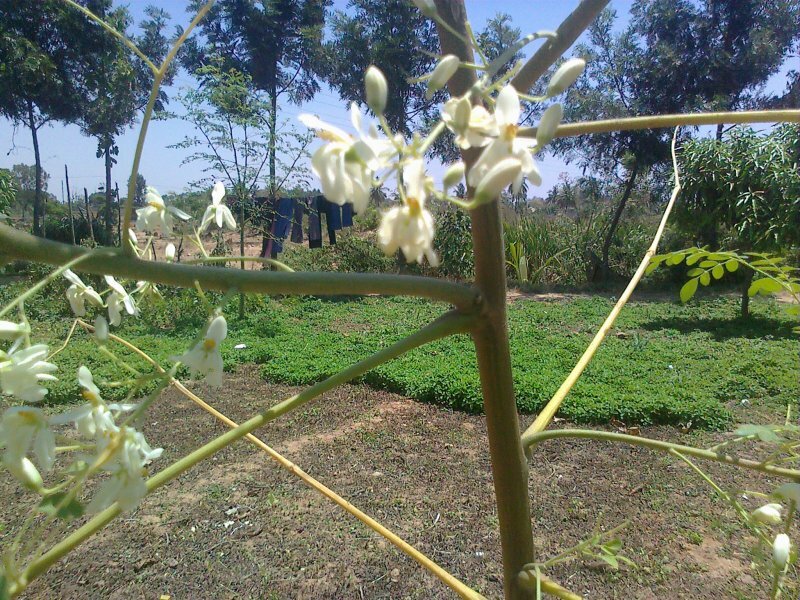 Another tiny drumstick plant which is about 10 months old is full of fruits, flowers and as per as my study is concerned, it is very dwarf and branches are distributed like how a professional can prune it as for our requirement. I have decided to keep all sticks of this plant for multiplication of such unique characters plant for better feature of me and my farming community. This BHGYA variety drumstick is giving about 500 drumsticks in a year without any special care with the same water giving along with Papaya. What is the spacing you adopted for papaya and drumstick? Growing drumsticks sounds like a very good idea…but how to sell it in wholesale? One of the things that scares me most about farming is finding the right customers. Is it possible for me to tie up with a customer in south India (where consumption of drumsticks relatively higher)? And I have also planted same number of Kapalpatti Murungai. Comparatively I find Kapalpatti Murungai better in terms of yield and maintenance. Do you have any pictures of both types that you can share please? Can you give some guidance which breed is giving the export quality, i got some name as Odisi?? Being a new comer in Agri culture , I also have a few points to share with this forum members I bought around 1600 plants from Mr.Alagarsamy who advised me to plant two saplings in a pit.This was done in feb 2016 .At the time of purchase i asked him for the guidance /practices which I should follow to have optimum possible growth and pod yield.He said all his brochures are finished and he would send all the details by mail.I am sorry to say that he never sent guidances by mail,every time I speak to him over phone he used say that he is in a meeting and he will call back but he never called me back.I also tried to find out how many farmers who had planted his variety are successful but I couldnt find anyone til date.He has a product he calmly sells the same but he is not at all an expert and will not be able t guide to achieve a good yielding crop.Please be aware of this man,I donot now how this man has been given so much of hype!!! However the flowering started in the month December 2016 and the pods yielded were not at all saleable.All had light blackish colour or light brownish colour and the pod skins were very hard and rough.But I am continuing with the same crop hoping that some one would guide me to have green colour pods,incidentally the second flowering has started in september 2017 and and the conversion into pods also are either light blackish or brownish. I can guide you to get seeds of PMK-1 variety, which is from Tamil Nadu, available in Hyd. Where can i get PKM 1 variety in hyderabad. Any farmer references those already use this variety? Yes. You can contact me. We will arrange to get you the PMK-1 type in Hyderabad only. Alagar Swamy Drumstick PAVM Yield is GOOD. It is perennial. But Pods are Bulkey and are not Marketable. In our Farm we could not found any Pest since FIVE Years. The Main Disadvantage is the Pods are very Bulky and ate not Marketable. But it is Tasty with More flush and the Fiber is Tender.It is Very GOOD for self usage of 3-4 Trees and not for Commercial. It is not known how he got President Of India Award.